There is still room in the Highland, NY workshop, Improving the Reliability of your Weather Station, Tuesday, February 24th. Plan to attend to learn about how to maintain and troubleshoot Rainwise weather stations connected to NEWA. Start time is 9:30 AM and end time is 12:30 PM, in the Conference Room, Hudson Valley Lab, 3357 US Highway Rt. 9W. John Gibbons with Rainwise weather station prior to siting on a farm. John Gibbons with twenty years’ experience working with weather instrumentation will lead the workshops. John will retire in April, so gain from his experience now! Debbie Breth, Lake Ontario Fruit Program, has loaned a weather instrument for hands-on use during the workshops. Registration will be limited to 20 people, pre-registration is required. Indicate how many people in your party are attending. This workshop is FREE, thanks to the ARDP! The New York State Apple Research and Development Program (ARDP) has provided funding to help us gather and deliver information on weather station maintenance to apple growers. The ARDP has graciously allowed us to extend this opportunity to all growers who have weather stations connected to NEWA. If you are located close to the workshop locations, I urge you to attend and learn about how to maintain and troubleshoot your weather station. If you are unable to attend, the weather station troubleshooting guide is available on the NEWA website, under About Weather Stations, select Troubleshooting Guide. This entry was posted in news on February 19, 2015 by jec3@cornell.edu. Understanding CougarBlight, the model for blossom blight used in NEWA, will greatly improve your ability to protect your orchard from fire blight. Getting the most out of CougarBlight, a recent article in Good Fruit Grower by Melissa Hansen on Feb 17, 2015, summarized a presentation at the annual meeting of the Washington State Horticultural Association given by Tim Smith, Washington State University Extension Educator for Douglas and Chelan counties and our adviser for the NEWA fire blight model. Fire blight strike coming in from a blossom infection. Note the dead flower cluster hanging below the shoot. 1. 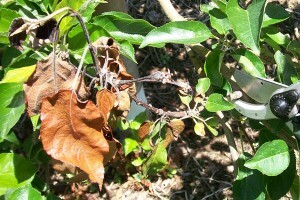 It does not indicate that fire blight will occur in your orchard. If you don’t have the bacteria in your orchard, there’s nothing there to create the disease, Tim Smith said. 2. When weather conditions occur that trigger fire blight, somebody is getting hit. Every time the model says that conditions are ripe, somebody is getting hit, though it might not be you. “The model never misses,” said Smith, noting that eastern Washington, with its dry climate, is blessed to be in a low-fire blight environment. 3. It is a flower infection model only. 4. It models the rate at which fire blight bacteria can grow, not the infection process. When trees bloom, bacteria begin to ooze from cankers that developed from strikes the previous season. Flies are drawn to the musty, sweet goo that tastes like molasses (Smith knows because he has tried it), and they deposit bits of goo and bacteria all over the tree, including stigma surfaces. Infection can occur if moisture washes bacteria down from the stigma to the young fruitlet and if the bacteria population is high enough. Small populations don’t trigger a pathogenic outbreak but large ones do. Bacteria multiply at a rate that’s governed by temperature and resources, Smith explained. The more moisture and food the bacteria have available, the faster they can grow at a given temperature. Blight bacteria can grow in a temperature range of 50°F to 90°F, and do best from 78°F to 90°F. Growth rate slows above 90°F and stops at around 100°F. Past models relied on mean temperatures (average between the high and low for the day), but Smith says they were too crude. Dr. Larry Pusey, retired U.S. Department of Agriculture researcher, found that peak temperatures were more important than mean temperatures relative to rate of blight bacteria growth. “It turns out that just one day at 88°F is enough to build up a colony,” said Smith. 5. 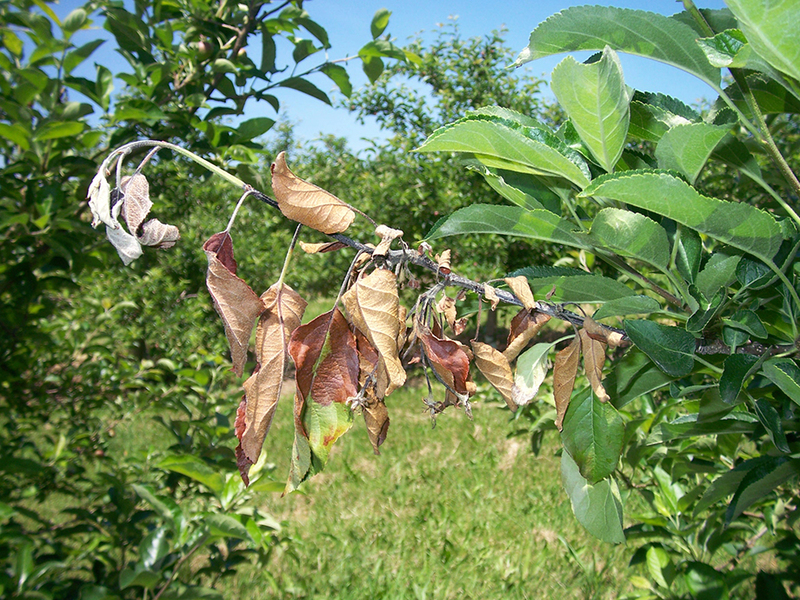 You must identify your orchard fire blight risk. To use the model, you must first determine fire blight pressure (high, medium, or low) for your orchard. “It’s very important to know how much fire blight is in your vicinity because it makes a huge difference in the temperatures needed to trigger infection,” he said. NEWA has a drop down list for the fire blight history in your orchard. It defaults to the medium level. Smith suggested that a guideline of 400 feet adjacent to the orchard be used in determining fire blight in the neighborhood. If you had no fire blight in your orchard and neighborhood last year, risk this year will be low. But a missed canker that wasn’t cut out in the winter can result in an orchard ‘hot spot’ and set the orchard up for a worst-case scenario. 6. The model’s risk value thresholds are to be used as a guideline. Threshold numbers are not absolute, but should be used as guidelines. Generally, the risk numbers work out well, he said, noting that a high risk number of 299 should not be considered much lower in risk than 301. 7. Moisture triggers fire blight. Wetting is what triggers the disease, not warm temperatures. Although warm temperatures enable bacteria to grow to high enough numbers that lead to infection, water is needed to complete the infection process, he said. But it’s more than rain that triggers fire blight. 8. Check the forecasting component of the model. Smith noted that growers should be sure to look at the (current) and (blossom blight 5-day forecast) when viewing the model. “…to control fire blight well, you have to look at the weather forecast, especially if using organic and biological fire blight agents.” Smith believes that the model’s forecasting risk feature is one of its most important parts. What should you do this season, if your pome fruit orchard or a neighboring orchard had fire blight last year? First, make sure all of the blight strikes were cut and removed from the orchard after harvest or during pruning. Blossom blight strike being pruned out. Next, put on a copper spray during dormancy, says Tim Smith, Washington State University Extension educator for Douglas and Chelan counties. “Copper sprays have been proven to make a difference in reducing the number of bacteria that make their way to the flowers,” he said. Biofungicides and biological products have a preventive action and should be applied when the CougarBlight model says risk is coming in the next few days. Products like Blossom-Protect (Aureobasidium pullulans) and Serenade (Bacillus subtilis) should be applied before it rains and infection takes hold. Also, they usually need reapplying every few days. “But the day it rains is when growers often respond,” Smith said. In that case, an antibiotic should be applied to combat infection of flowers. Product labels must be checked when spraying during secondary blooms because many products are restricted for that time period, he said. 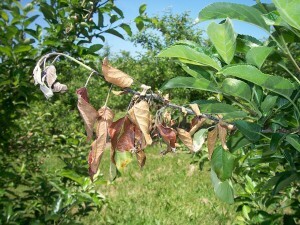 Find the NEWA fire blight tool on the Apple Diseases page, http://newa.cornell.edu/index.php?page=apple-diseases. It charts CougarBlight degree hours, wetting events, takes into consideration streptomycin sprays and your bloom date, and will predict appearance of trauma shoot blight symptoms. Contact Dr. Kerik Cox, Extension Tree Fruit Pathologist, Plant Pathology & Plant Molecular Biology, Cornell University, for more information. This entry was posted in about models on February 18, 2015 by jec3@cornell.edu. We will hold two workshops, Improving the Reliability of your Weather Station to learn about how to maintain and troubleshoot your weather station. Both start at 9:30 AM and end at 12:30 PM. The first is in Geneva, NY on Thursday, February 19th, in the Staff Room of Jordan Hall, 630 W. North St., NYSAES. The second is in Highland, NY on Tuesday, February 24th, in the Conference Room, Hudson Valley Lab, 3357 US Highway Rt. 9W. Registration will be limited to 20 people at each location, pre-registration is required. This workshops are FREE, thanks to the ARDP! The New York State Apple Research and Development Program (ARDP) has provided funding to help us gather and deliver information on weather station maintenance to apple growers. The ARDP has graciously allowed us to extend this opportunity to all growers who have weather stations connected to NEWA. If you are located close to the workshop locations, I urge you to attend and learn about how to maintain and troubleshoot your weather station. If you are unable to attend either of these sessions, the weather station troubleshooting guide is available on the NEWA website, under About Weather Stations, select Troubleshooting Guide. This entry was posted in news on February 11, 2015 by jec3@cornell.edu.